Sukumar, a shopkeeper, bought the crackers as Deepavali is fast approaching, and he hoped to sell them in his shop. He lost his son in the accident. 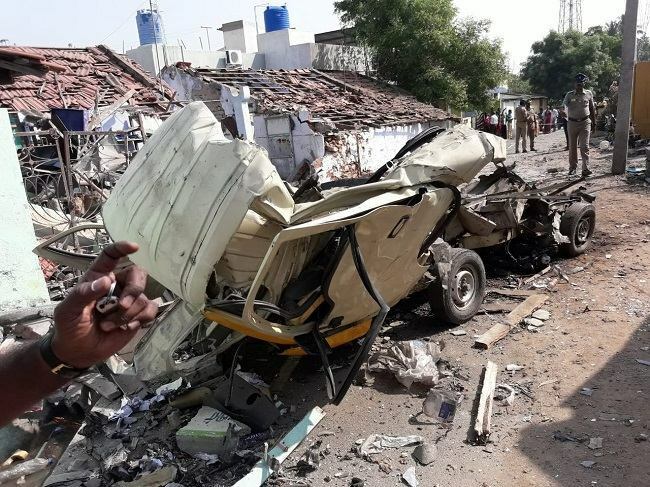 Three persons were killed in Erode, in the wee hours of Wednesday, when firecrackers packed in gunny bags exploded while they were being unloaded. Sukumar, who ran a grocery store in the neighbourhood and purchased the fireworks, fled the spot after the incident, but was caught by the police later on Wednesday. On Tuesday, he purchased crackers to sell in his shop as Deepavali is fast approaching. In order to store the stock of firecrackers safely, he put them in a load auto and took it to his house in Sastri Nagar, which he used as a godown to stock his products. He was accompanied by his son Karthik and two others to load and unload the goods. While unloading the sacks, it is reported that one of the sacks fell down on the ground and the crackers inside it went off due to the impact. The fire resulting from the explosion quickly spread and gutted the auto in which it came and another auto that was parked near it. The force of the explosion also caused the godown, in which the fireworks were supposed to be stored, to collapse. Many houses nearby were damaged due to the explosion and the roofs of the buildings also collapsed. The three persons who died in the accident have been identified as Karthik, who is a final-year engineering student, Murugan, who runs a grocery shop, and Sendhoorapandian, who runs a business of supplying drinking water. Sukumar is said to have fled the scene immediately after the incident. Fire rescue services and the police rushed to the spot immediately, recovered the bodies and sent them for autopsy.